France, 1958, 90 minutes, Black and white. Jeanne Moreau, Jean- Marc Bory, Alain Cuny, Jose de Villalonga. 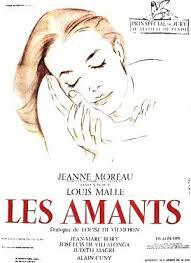 Les Amants is a second feature film by Louis Malle, after directing some documentaries. He was to have a successful career for 30 years. In the 1960s he made a variety of films, including Viva Maria, working again with Jeanne Moreau. In the 1970s he made Lacombe Lucien about occupied France. Working in America he made such films as Pretty Baby, Atlantic City, Alamo Bay. He also made the autobiographical film Au Revoir Mes Enfants, Farewell, my Children. His last films were the British Damage and Vanya on 42nd street. The Lovers caused controversy in its time, in America being sued for obscenity. However, after long court proceedings the film was pronounced as not being pornographic. In itself, it has a simple plot: a bored housewife, a busy and detached husband, a young daughter, the wife having an affair with a celebrity polo player, a chance encounter with a young man, infatuation, a sensual and passionate night spent with him, a decision to leave home and family. More direct than many of the films of the past, it was part of the new wave, Nouvelle Vague, then beginning, from significant French directors like Truffaut, Chabrol, Godard. 1. An early film of Louis Malle? The French new wave? A film of the late 1950s? The work of a man in his mid-twenties? 2. The visual style, black and white photography, locations, the use of Brahms’ music? 3. The directness of the title, the basic plot, the perspectives in the treatment, both real and lyric, the final passionate part of the films? The controversies of the 1950s? 4. The use of the voiceover, of Jeanne? 5. Jeanne’s life, the home, her marriage to Henri, their daughter, Catherine? Her friend in Paris, her relationship with Raoul, his being the star polo player? A sedate life, her wanting more, the affair, life in Paris? 6. Henry, the presence of Alain Cuny, his age, running of the paper, busy, the formality of the relationship, his detachment? The scenes at home? 7. Raoul, his reputation, his skill at polo, the nature of his affair with Jeanne? 8. Jeanne Moreau, in her early career, her portrayal of Jeanne, the detail? At home, the relationship with Henri, formal? Her visits to Paris? The scenes with Raoul? Her visit to her friend, confidante? The car, driving, the breakdown, the encounter with Bernard, the ride, their laughing together, about the bear? Her bringing him home? The night, the passionate and sensual love scene, suggestions rather than explicit? The length of the scene? The bed, the bath, the morning and night, her decision to leave? Driving into the sunrise? 9. Bernard, in himself, relationships, pretensions, the night, his relationship with Jeanne, the decision to leave? 10. Jeanne leaving, the decision to leave her daughter, to leave Henri? How realistic a future? A permanent relationship with Bernard or not? Her discovery of love, despite uncertainty?